Rob Levitt is one of Chicago’s leading butchers, and his store, The Butcher & Larder, has grown its clientele since moving a short distance from its tiny original shop to the Local Foods retail store than opened last June. Customer service and information is part of the store’s stock in trade, and FamilyFarmed is pleased that Levitt will be conducting a ham curing workshop — timed to the Easter holiday on which ham is a traditional favorite — at its Good Food Festival on Saturday, March 26. It is a return engagement for Levitt, who conducted a pâté making workshop at the 2015 Good Food Festival. The article below describes Levitt’s love of ham, his dedication to providing the highest quality products, and his devotion to consumer education about meat. 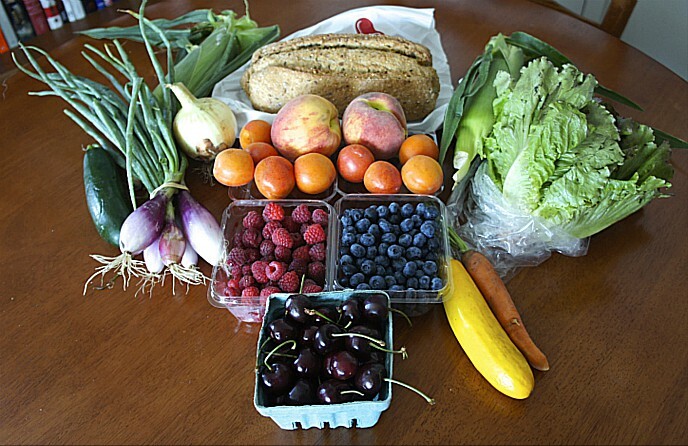 To learn more about the three-day Good Food Festival & Conference, click here. To purchase tickets, click here. Rob Levitt, one of Chicago’s leading butchers, is conducting a ham-curing workshop at FamilyFarmed’s Good Food Festival on March 26. The choice of a ham class makes sense, and not just because the event is on the weekend of Easter, a holiday on which ham is one of the traditional dishes. 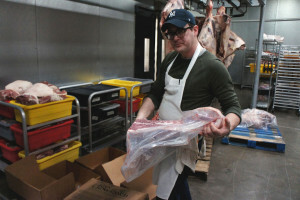 Rob Levitt, founder-owner of Chicago’s The Butcher & Larder, shows off a rack of sustainably produced pork in his spacious cooler. Easter hams brine in bins to the left. For one thing, Levitt — founder and head butcher at Chicago’s The Butcher & Larder store — loves ham. “Cured ham is my favorite thing in the world,” said Levitt in an interview on March 15, adding that for his first Father’s Day, his wife Allie (a talented chef with whom he worked in restaurants before they started the store in 2011) gave him an aged Benton’s country ham and a custom-designed ham-cutting knife. The Butcher & Larder’s original shop, about a mile south in the Noble Square community was tiny. Its location at Local Foods thus was like a dream come true for Levitt and his team, providing them with ample space to prep the whole carcasses they receive from sustainable and mostly regional producers (the cutting tables in the original store were right in the middle of the shop); rooms where aging or cured meats are hung; and a smokehouse all their own. 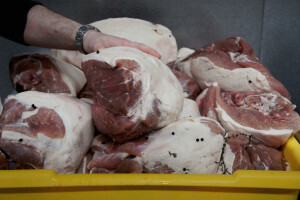 The expanded facilities enjoyed by The Butcher & Larder since it moved into the Local Foods store have especially benefited its ham curing program. Here hams brined in preparation for the smoker in advance of the Easter holiday. 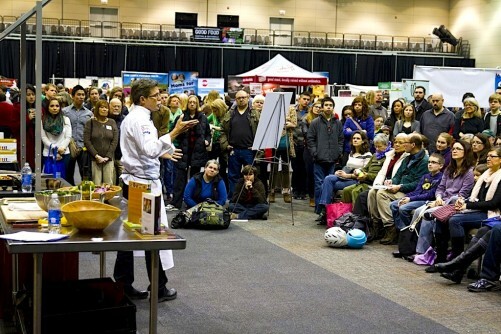 There also is a good reason why Levitt is a great choice to do a workshop at the Good Food Festival for the second consecutive year (he conducted a class on pâté making at the 2015 event). Levitt has always put customer service and information first. Rob Levitt of Chicago’s The Butcher & Larder is conducting a ham curing workshop at FamilyFarmed’s Good Food Festival on March 26. 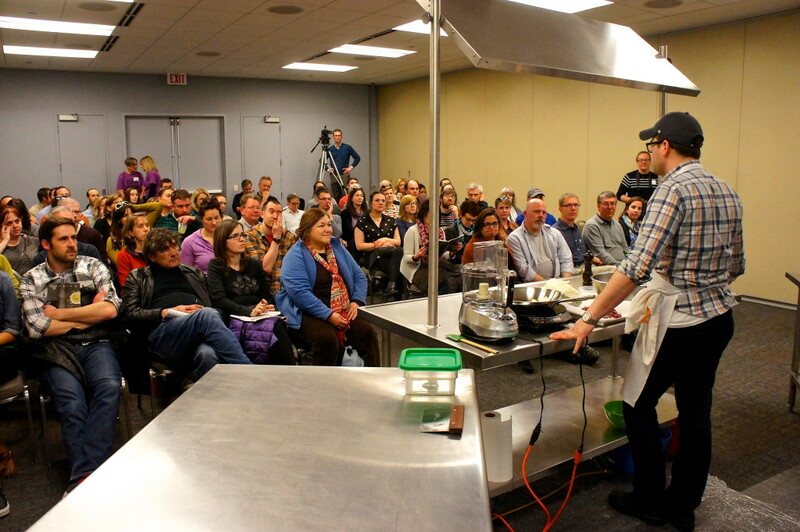 Here he filled a room for a charcuterie workshop at Family Farmed’s 2015 Good Food Festival. Since The Butcher & Larder is a whole animal shop, it is trying to sell every cut of meat, from the high-end “restaurant” cuts such as ribeyes and New York strip and crown roast of pork and rack of lamb to the least expensive cuts that are best when slowly braised. And Levitt and his staff excel at informing customers about some of the cuts that are less familiar and less expensive but nonetheless delicious. 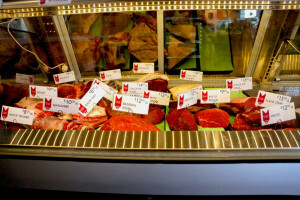 Chicago’s The Butcher & Larder store, located in the Local Foods retail market, is a whole animal practice that sells cuts from the most familiar to some that are new even to some beef aficionados. Along with the everyday information sharing at the shop, The Butcher & Larder conducts occasional meat-cutting workshops. While Levitt does most of these, other staff members also participate — including McCullough Kelly-Willis, one of the rising number of women choosing butchery as a career, who conducted a lamb workshop on March 15, just before the St. Patrick’s Day and Easter holidays. Meat cutting classes are an important part of the consumer information efforts by Chicago’s The Butcher & Larder. 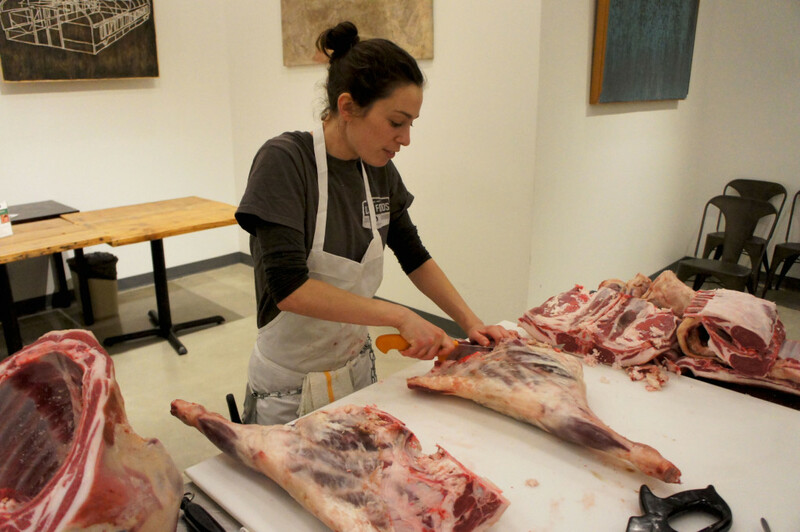 Here McCullough Kelly-Willis, a staff butcher who conducted a March 15 class on cutting down a whole lamb, trims the legs. This entry was posted in Beef, Butchering, Food Artisans, Food education, Food Entrepreneurs, Good Food and economic development, Good Food business development, Good Food Festivals, Good Food Success Stories, Good Meat, Grass-fed beef and tagged butchers, consumer education, consumer information, FamilyFarmed, Good Food Festival, Good Food Festival & Conference, Good Food movement, ham, Local Foods Chicago, meat, meat and Good Food, Rob Levitt, The Butcher & Larder. Bookmark the permalink.